The Kingdom of Saudi Arabia (KSA) is known as the heart of the Arab and Islamic worlds. The Kingdom is revered as the land of the two holy mosques and the direction to which Muslims all over the world, turn towards in prayer, every day. The second largest Arab state, over the past decade, KSA’s GDP (Gross National Product) has grown by about 520 billion USD owing to the positive import-export trade balance. In fact, Saudi Arabia exports revenue is 2.5 times more than its imports revenue. In his Vision 2030 statement, the Crown Prince Royal Highness Prince Mohammed bin Salman bin Abdulaziz envisions to build Saudi Arabia as an investment powerhouse and a hub connecting the continents of Asia, Europe and Africa. Thanks to this vibrant economy, the population will continue to grow with the influx of expatriates from all over the world. In 2019, the population of Saudi Arabia stands at 34.14 million according to the data provided by the World Bank. That translates to a growth rate of 1.93% from 2018 when the population of Saudi Arabia was estimated to be 33.14 million. We have seen varying figures in several sources while researching data on the population of Saudi Arabia. Each of these sources has employed their own methodologies and data calculation systems to arrive at the population count. We have decided to adopt the information provided by the World Bank as their figures match the data published by official websites. We have listed out these different figures in the following table. In the following weeks, we will be examining KSA’s 2019 population in detail, from the perspective of population demographics, gender statistics, city-wise distribution and more. Meanwhile, you can read through our detailed blog analyzing the population of Saudi Arabia in 2018. The population of Saudi Arabia in 2018 is estimated to be at 33.5 million, based on our research. The last census in Saudi Arabia was conducted in 2016 and the population of the country then was measured to be 32.55 million. The next census is expected to be in the year 2020. The current population was estimated by considering the population growth rates in major cities as well as other factors influencing population, like birth, immigration and mortality rates. 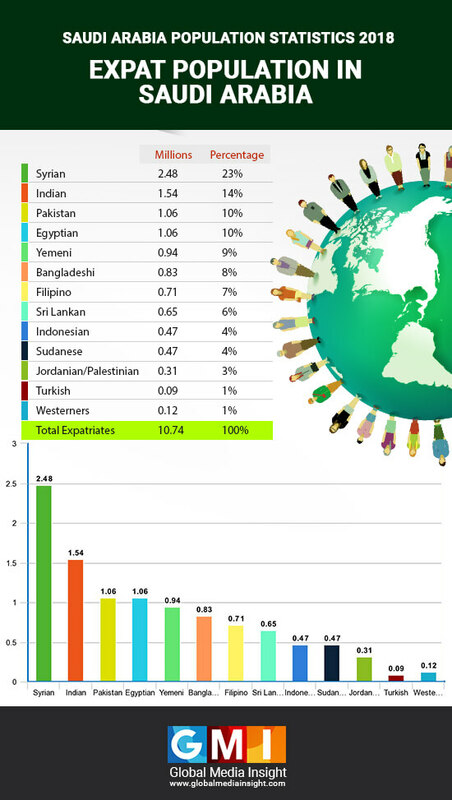 Several authentic sources like World Bank, United Nations, WorldoMeters.info, WorldPopulationReview.com and PopulationPyramid.net have estimated the the population of several countries including Saudi Arabia until 2050. The cities of the Kingdom of Saudi Arabia (Saudi Arabia) are centers of industry and culture. The capital, Riyadh is the biggest city with a population of 4.21 million. Almost all the companies that operate within the Saudi borders are headquartered in Riyadh. Several large plastic and metal factories are located in and around the city. These factories along with government-owned petrol company Aramco’s Riyadh Refineries are the biggest sources of employment in the city. Situated at the center of the Arabian Peninsula, Riyadh is truly at the heart of the Arab world. The second biggest city in Saudi Arabia is Jeddah, the gateway to Mecca and Medinah – Islam’s holy cities. With a population of 2.87 million, Jeddah is the commercial capital of Saudi Arabia as well as the biggest port along the Red Sea. The city is also a very important tourist destination, playing host to thousands of tourists every year. Several industries like mining and glass manufacturing are located in and around Jeddah. The third most populated city in the Saudi Arabia is the holy city of Mecca with a population of 1.32 million while Medina with 1.30 million people is third. The city of Sultanah in Al Madina district with a population of 0.95 million is fourth and Dammam is fifth with 0.77 million people. More than 30% of the Saudi population are expats. The total number of non-Saudis in the country is estimated to be 10,736,293. Nearly a quarter of this are Syrians fleeing the war in their country. Almost 2.5 million Syrians live in Saudi Arabia and they are given free access to education and healthcare, as well as encouraged to take up jobs in the country. Unsurprisingly, Indians are the second most numerous diaspora in the country. There are 1.54 million Indians in Saudi Arabia with most of them employed in the hospitality and mining industries. Saudi Arabia is also the largest market for unskilled Pakistani workers. The country hosts nearly 1.06 million Pakistanis, most of them working in unskilled sectors like construction. The number of Egyptians in Saudi Arabia is 1,062,999 while the number of Yemenis is almost 1 million. Bangladeshis are another important diaspora with 826,777 people. Other major nationalities in Saudi Arabia are 708,666 Filipinos, 649,611 Sri Lankan’s, 472,444 Indonesians, 472,444 Sudanese, 307,089 Jordanian/Palestinian and 94,489 Turkish. Apart from these, there are also 118,111 people from Western countries. A large percentage of the Saudi workforce is employed in the oil and mining industry. The kingdom is the world’s leading oil exporter, accounting for almost one-sixth of the world’s total oil export and the second largest producer. The country is undergoing a rapid socio-economic transformation that is spearheaded by the Saudi family. While there was an almost equal number of men and women in the country in 1960, the gender ratio is now 140 men per 100 females. The country now has 18.76 million men and 14.33 women, meaning women make up 43.31% of the population. Most of the country’s population(nearly 47%) is in the working age range of 25 to 54 years. Men outnumber women in the age group 25 to 54, while there is a much higher number of women in the age group 55 to 64 years. Saudi women now play a much more active role in society. The country has given women voting rights and they are being encouraged to play a more inclusive role in society. More and more women are joining the workforce as the government looks to diversify the economy. Women are now allowed to possess and drive cars in the country as per a royal decree issued in June 2018. With the discovery of the two largest oil fields ever discovered in the world, Saudi Arabia has gone through a massive population boom. The country is a large market for employment in foam, insulation and plastics, as well as chemicals that go into adhesives, coatings and cosmetics. The population boom has been particularly evident in the last decade with the population increasing by nearly 2 million between 2007 and 2008 as well as between 2008 and 2010. From just 23.98 million in 2007, Saudi Arabia has now grown rapidly to exceed 33.54 million. The diversification of the economy driven by the new generation of the Saudi family has made the country into a haven for migrant workers. Ever since his ascension in 2005 King Abdullah has been championing the modernisation of Saudi government. The House of Saudi has been ringing in the changes after Mohammed bin Salman took over as the new crown prince in June 2017. He is the first leader of Saudi Arabia from the Millennial generation, regarded by many as responsible for the modernisation of Saudi values with women given driving rights for the first time and increasingly encouraged to have an improved standing in society. The country’s theaters now show cinemas, for the first time since 1965, and the government has also started issuing new tourist visas, besides the Haj visa that is reserved for Muslims. Nowhere has the digitisation been more evident than in the field of social media. Over 30 million Saudi Arabians use social media on a daily basis and nearly 18 million of them are mobile social media users. With the increased involvement of women at the workplace, the modernisation of Saudi Arabia is expected to gather pace. To get your brand’s message to your clients in Saudi Arabia or abroad get in touch with Global Media Insight today. We have over 17 years of experience in digital technologies and social media and digital markets along with expertise on the latest tools to drive engagement to increase your business’s brand value and customer loyalty. Talk to us to discover social media strategies that work across platforms and channels.